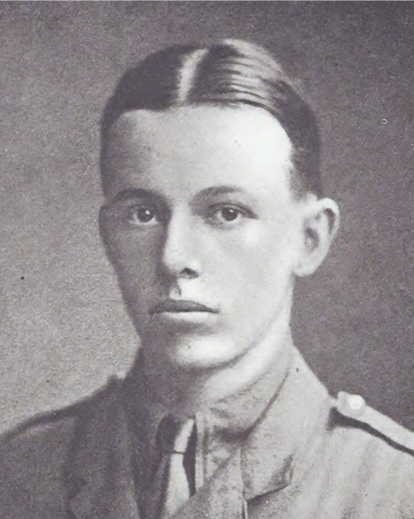 Geoffrey Clarke (2nd Lieut. Rifle Brigade). Aged 33. John Ruttledge (Capt. West Yorks Regiment). Aged 21. 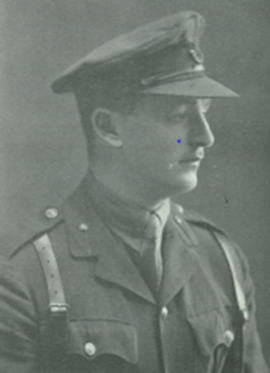 Christopher Counsell (Lieut. Hampshire Regiment). Aged 26. 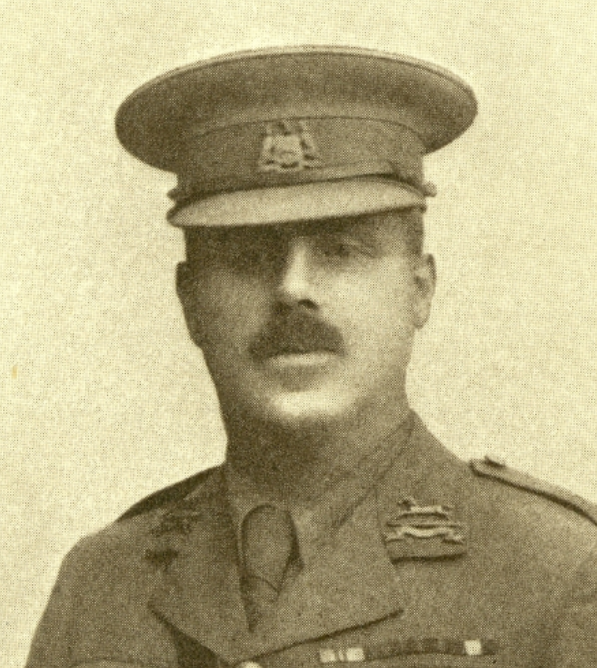 Robert Gibson (Lieut. South Staffs Regiment). Aged 21. David Westcott Brown (Capt. Leicestershire Regiment). Aged 23. 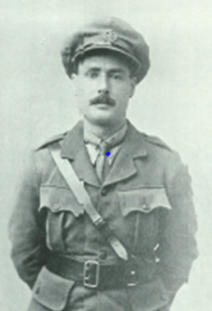 Paddy Burton (Temporary Capt., 4th Bedfordshires). Aged 23. 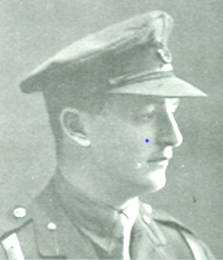 Frank Benham (Captain, RFA). Aged 30. 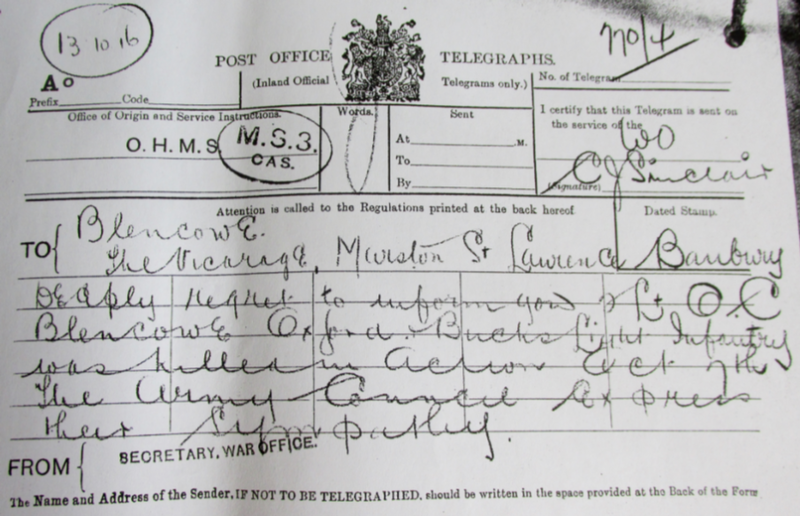 Oswald Blencowe (2nd Lieut., Ox & Bucks Light Infantry). Aged 26. 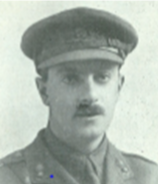 John Raikes (2nd Lieut. Essex Regiment). Aged 20. The world seems full of you, now you are gone. That we, like you, must strive to bear our part. To that high goal your passing has revealed. Surely the gift is fitting in God's eyes. Though we may see your well-loved face no more. That we may reach those heights you died to gain. I was conducted into the presence of the Brigadier, a young and very handsome man with many medals. He was reading the ‘Times’ and told me to sit down and eat. Then he gave a very refined groan and went on reading the paper. 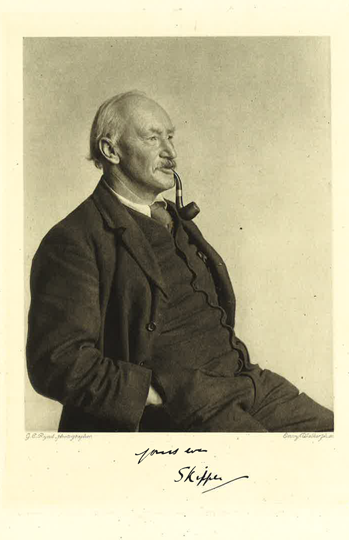 It was not long before I learnt that this Brigadier was as ready to be soaked through as any of the men, but, at the time, he seemed an exquisite being, remote from war, and mud, and hardship. Our old friend ‘Fluff,’ Lieut. – Col. Stuart Taylor (West Yorks) has recovered from his wounds. He returned to command his battalion on September 16th and, although he cannot say as much, I think it highly likely he is somewhere in the region of the Somme. “We are living in stirring times now and there is much doing. I wish I could tell you all about it, but the censor rules are very strict. There are one or two things I hate in the trenches worse than the Boches – rats and cats. The rats are enormous grey shiny looking things with great fat tails, and they come out in swarms at night and eat up all the horrid things they can. You would think the cats would eat the rats, but they do not, I regret to say. They are kittens which have been born since the war, in the desolated and ruined villages and towns of Northern France, and they are rapidly forming a new species of wild cat, living in old disused trenches or holes in the ground and coming out at night. This is not the way of nature, but it is to be supposed that war is bound to have some sort of effect on all who partake in it – even cats and rats, it now seems. 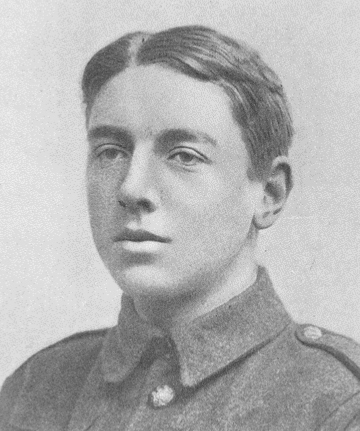 An eighth Old Dragon has laid down his life in the battle that has been raging on the Somme since July 1st. 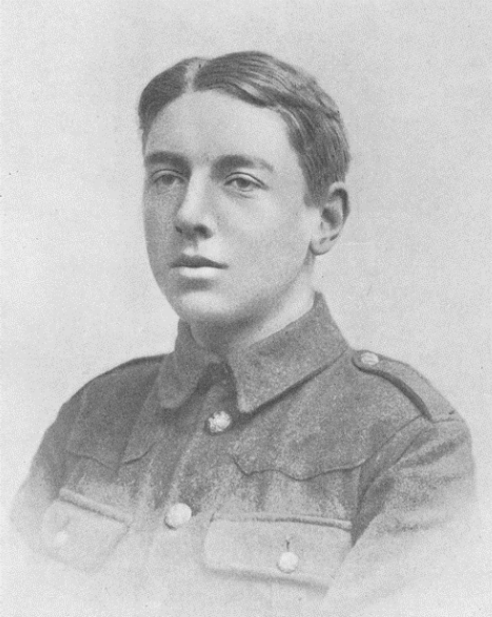 Oswald was killed on 7th October 1916 when temporarily attached to the Rifle Brigade. 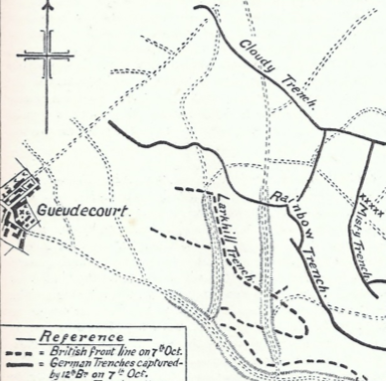 It was the Brigade’s task to capture Rainbow and Cloudy Trenches, near Guedecourt. As soon as our barrage lifted the Riflemen (some of whom had been lying down in the open awaiting this moment) rose bravely to make the attack. On reaching the crest of a hill about twenty yards from the German line they met with heavy machine-gun fire. All five officers of the two leading companies went down – four (including Oswald) were killed and a fifth severely wounded. It is of some small consolation that the reserve troops coming up behind them were able to take Rainbow Trench. 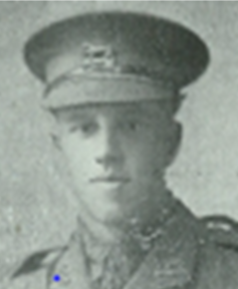 “He had been temporarily attached to this battalion and had only been with us three days. He went into action alongside his battalion and was killed during a successful attack in which he was with the leading company. The news of Oswald’s death did not reach his parents until October 13th, six days after the event. 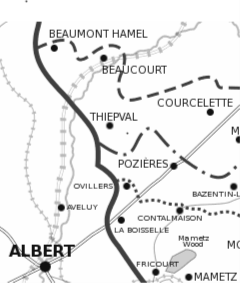 28/9/16 “Well, as you know, on July 1st our Battalion was told off to attack a certain part of the German line. Lieut. Clarke, who was then our Battalion Bombing Officer, had rather a tough job and it was while going over towards the 3rd German line that I came across him. He was then slightly wounded, but refused all assistance and would insist on keeping going. He was again wounded, rather badly this time, but still refused all help and insisted on us to get along. That was the last I ever saw of him; he was then lying in a trench hole. During the fighting and excitement that followed, I lost touch with him, but was told by a man who has since been killed that he saw a shell pitch into the hole that Lieut. Clarke lay in and he saw a body blown into the air. This is most painful reading for all those of us who knew him so well.